I met Don Heddesheimer at one of David Irving’s Real History conferences in Cincinnati, Ohio. I was there to present a paper myself, but got really mesmerized by Don’s paper. He presented his preliminary research results about a trail of newspaper articles and ads published in the News York Times from the middle of the First World War right up to the Second World War which were talking about Six Million Jews suffering and dying. Right there I came to an agreement with Don to have his research expanded and turned into a book. That book, The First Holocaust—Jewish Fund Raising Campaigns With Holocaust Claims During And After World War One, first appeared in 2003. It has left quite an impression and has led to others looking into the issue. Thomas Dalton, for instance, has traced the figure of Six Million Suffering Jews as far back as into the 1860s! (See the 2010 edition of my Lectures for more.) So do you still believe in the Six Million? Maybe you should, or else you may get yourself into hot water! As we all know, roughly six million Jews were killed by National Socialist Germany during World War II, or so we are told. This genocide is today generally referred to as the Holocaust or the Shoah. But how do we know that six million Jews lost their lives? And for how long have we known it? Whereas it seems that the first question can be answered by demographic research on the Jewish losses during World War Two, the second question has to be directed to historians. But considering that the Holy Holocaust is without any doubt the biggest taboo of our times, is this really a matter of course? In a comparative analysis of Benz’ study with a major revisionist analysis of Jewish population losses during World War Two, I pointed out that Benz’ work has so many logical, methodic, and systematic flaws that its result have to be rejected. But if it is true that we do not have a reliable demographic study that shows without a doubt that six million Jews lost their lives during World War Two, then why are we confronted with this six million figure? Where does this figure originate? And when was this figure first propounded? The late Dr. Joachim Hoffmann was the first mainstream historian who marveled over this question. In his 1995 study Stalin’s War of Extermination 1941-1945, he pointed out that the chief Soviet atrocity propagandist, Ilya Ehrenburg, had publicized the six-million-figure in the Soviet foreign press as early as January 4, 1945, i.e., fully four months before the war’s end. At that time, no demographic figures could have been available to him. 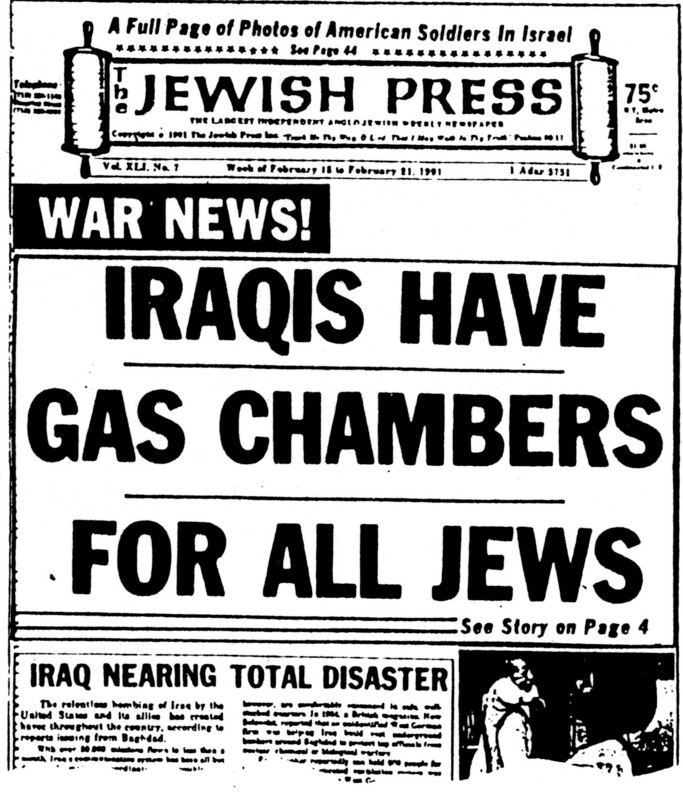 Just a year later, British Historian David Irving emphasized that as early as June 1945, in other words immediately after the end of hostilities in Europe, some Zionist leaders claimed to be able to provide the precise number of Jewish victims – six million, of course – even though the chaos reigning in Europe at that time rendered any demographic studies impossible. “What is happening to the 5,000,000 Jews of German-held Europe, all of whom face extermination […]. “Immediate action by the United Nations to save as many as possible of the five million Jews threatened with extermination […] was demanded at a mass demonstration […] in Madison Square Garden last night. 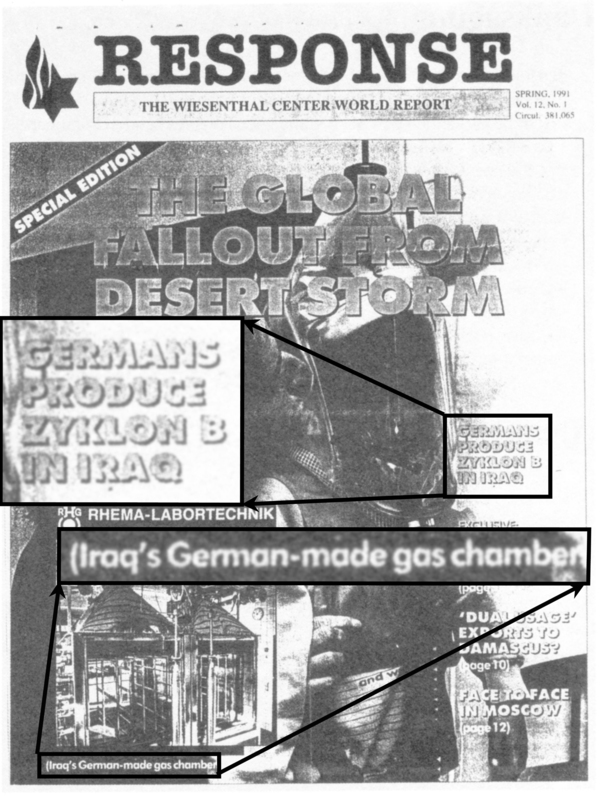 Butz also shows that the origins of these articles were Jewish-Zionist pressure groups like the World Jewish Congress and the American Jewish Congress. Initially, their claims were not taken seriously in Washington, until Henry Morgenthau of the Treasury department managed to reduce the influence of the State Department on official U.S. politics. That Weizmann’s reference to six million threatened and/or suffering Jews is neither an exception nor by any means the earliest reference to this figure, is now shown by Don Heddesheimer. He has collected a vast amount of material indicating that the propaganda unleashed by Zionist organization during World War Two was not unprecedented. As a matter of fact, it is a mere repetition – or should we say continuation? – of propaganda, which intensified during World War One (!) and reached its first culmination in the 1920s. Already by then, the figures of five or six million Jews threatened by death were widely publicized and were used as a means to an end: namely the uncritical support of Jewish and Zionist political goals. To go one step further, Heddesheimer even found a source from 1900 claiming that six million suffering Jews were a good argument for Zionism (see p. 41). During World War Two, Zionist pressure groups found a very convenient propaganda target in National Socialist Germany, whose extremely anti-Jewish politics invited all sorts of credible sounding accusations. Before, during, and immediately after World War One, however, the situation was more complex. As Heddesheimer shows, the major target for polemic attacks in the years before World War One was czarist Russia due to its policies toward Jews, which many Zionists considered to be anti-Jewish. After czarist Russia’s defeat was apparent in 1916/1917, Zionist propaganda switched its target over to Germany (see pp. 39f. of this book), whose ally, the Ottoman Empire (Turkey), needed to be defeated to ‘liberate’ Palestine for Zionist plans (and of course in order to secure billions of dollars lent to the British and French). Such propaganda accusations against Germany, however, ceased at war’s end, because Germany, in those years, was quite willing and capable of defending itself against such untrue propaganda. After the end of World War One, when Zionist dreams about Palestine were temporarily disappointed, but new hopes had arisen with the Soviet experiment in Russia, no particular country was initially singled out, even though there was a perfect target: Poland. Between World War One and World War Two, Poland was a military dictatorship, which implemented a policy of ‘ethnic pressure,’ i.e., all non-Polish minorities were subjected to discriminations and various degrees of persecution with the intention to ‘convince’ them to emigrate (quite similar to what Israel does today in Palestine against non-Jews). The Jews in Poland were not exempt from this treatment. As a matter of fact, Polish official as well as unofficial anti-Judaism was so massive that many Polish Jews preferred to live in Germany even during the Third Reich until late 1938 rather than to stay in their native country. Hence, there was enough justification to massively attack Poland for its rabid anti-Jewish attitude as there were reasons to attack Germany after Adolf Hitler rose to power there and step by step implemented a policy increasingly comparable to that already in effect in Poland. 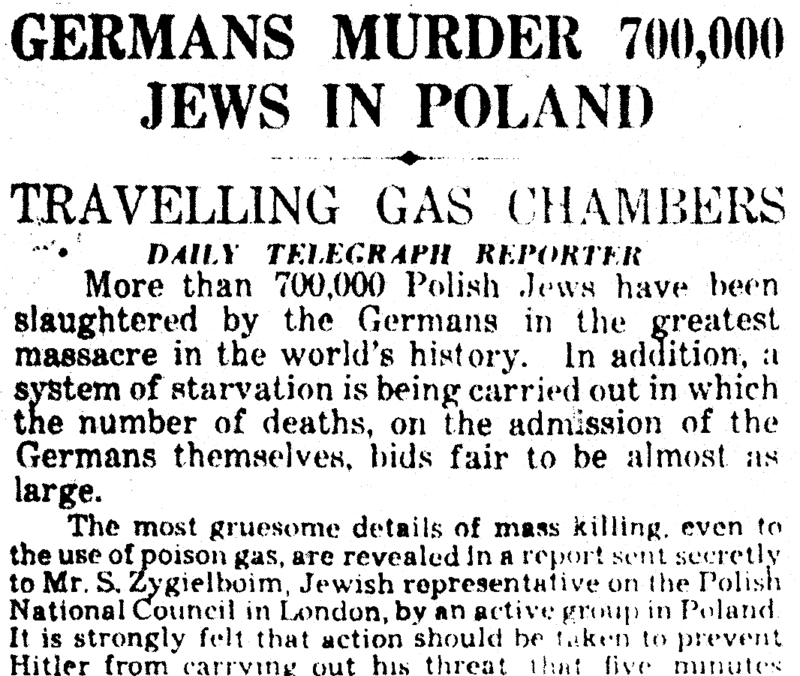 Although it can be shown that The New York Times accused Poland of anti-Jewish persecution in many articles – whereas this newspaper was basically silent about similar persecution suffered by Germans, Lithuanians, Ruthenians, Ukrainians, and Slovaks residing in Poland –Heddesheimer does not focus on this aspect, because his book is not about the suffering and persecution of Jews in eastern Europe, but about propaganda and fund raising in New York. I therefore want to draw the reader’s attention to a few examples of articles in The New York Times addressing anti-Jewish persecution in Poland. False claims of Jewish suffering would be cruel, indeed, and it sure is nice to read it from the horse’s mouth. It is troubling, however, when such claims are falsely attributed as in this case where the New York Times apparently could not suppress its prejudice to potentially see the ‘evil German’ behind everything. This was roughly one year before Hitler was elected Chancellor of Germany! Even though Poland’s anti-minority policies in general and anti-Jewish policies in particular, which started right at this country’s establishment in 1918/19, made it a perfect target for criticism, this aspect of Polish history is today almost forgotten. As we know today, the largest suffering of mankind between the two world wars was happening in the Soviet Union, so one would expect that the Zionist organizations would name the Red Terror as one main reason for the claimed sufferings of Jews. But this didn’t happen until later. The reason for that can be deduced from one example, shedding bright light onto how the New York Times viewed the situation of Jews in the Soviet Union. In late 1922, this newspaper reported that there were some hostilities toward Jews in the Ukraine, but that this was stamped out violently with the help of a Jewish army of allegedly 500,000 soldiers – an army that could have been formed and operated only with the consent of the new Soviet authorities. In other words: Considering the terror inflicted upon the civil population of the early Soviet Union in general and the Ukraine in particular by armed and unarmed units of the Soviet authorities, it must be assumed that this Jewish army was one important factor causing terror rather than defending against it. And the New York Times depicted this essential part of Red Terror as heroic, justified Jewish self-defense. This attitude can be understood if one keeps in mind that many Zionist Jews looked at the new Soviet Union as a Jewish dominated and controlled experiment of a Jewish led country free of anti-Judaism. Another aspect of the story is to trace the money raised by those fund raising campaigns. In chapter five, Heddesheimer addresses this question. The literature quoted by him shows that Jewish organizations were indeed using some of the money to assist the Jewish populace in Poland. But on the ugly side, as Heddes­heimer hints at in his fifth chapter, it also served as a fund raising drive to support various aspects of the Jewish dominated communist revolution in Russia, or in other words: to wittingly or unwittingly finance the Jewish-Soviet holocaust against Christians in Russia, the Ukraine, and all the other states within the Soviet Union. In contrast to that, the second large-scale Zionist fund and support raising campaign during World War Two was pointed at the creation of Israel, and this propaganda has never ceased. First of all because Israel has a continuous need for massive support, whereas the Soviet Union did not get any more such support after it became basically de-Judaized under Stalin, and secondly because Germany collapsed totally after the war and has never been allowed to defend itself against those Zionist propaganda claims; quite to the contrary: it is punishable by law in Germany and many other European countries to challenge those claims. In his last chapter, Heddesheimer briefly investigates whether or not the claims of extraordinary Jewish sufferings made by Zionist pressure groups during the late 1910s and the 1920s were based on facts. Did Jews in Central and eastern Europe suffer more than the average populace in those countries, which had collapsed after World War One? Was there indeed a holocaust looming or going on in the years between 1915 and 1927? Using contemporary Jewish population statistics, Heddes­heimer briefly points out that the worldwide Jewish population was growing much faster during and shortly after World War One than the other religious and/or ethnic groups who lived in the same countries. That should suffice to answer the above questions. One might also easily conclude that if those first holocaust claims were true, it would dominate our history books as the First Holocaust. But since it cannot be found there, we can rightly assume that this propaganda was untrue. To close my preface, I would like to briefly mention the means of alleged Jewish suffering in both holocaust propaganda claims. Whereas simple poverty is mainly claimed to have been the reason for the (invented) First Holocaust, mass murder by gas chambers and executions are supposed to have been the means during the Second, the ‘real’ Holocaust. “The Daily Telegraph,” March 22, 1916, p. 7. The Governments of the Allies have secured evidence and documents, which will shortly be published, proving that Austria and Bulgaria have been guilty of horrible crimes in Serbia, where the massacres committed were worse than those perpetrated by Turkey in Armenia. 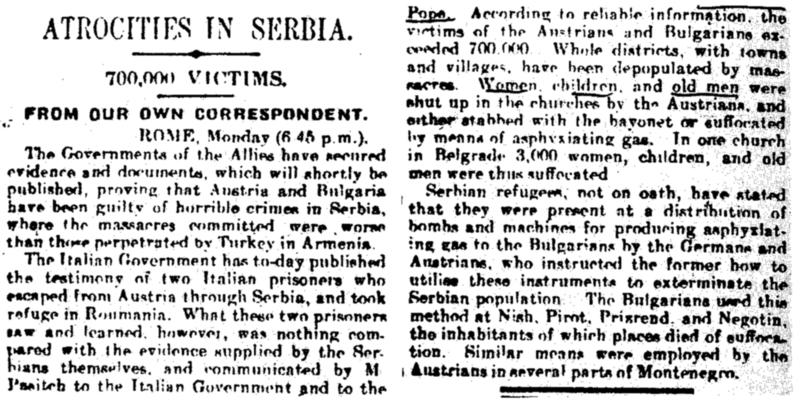 Of course, today no historian claims that the Austrians or any of their allies ever committed mass murder with poison gas in Serbia during World War One. This was nothing but black propaganda issued by the British government and eagerly disseminated by the British media. This time, however, we all know that these claims were true, don’t we? And it is also true that at the end of the 20th century nobody would seriously accuse any country in the world of having built gas chambers and stocked Zyklon B to murder all Jews, hence, that the Jews would once more face a holocaust, an extinction of millions. After all, that was something uniquely German and ‘Nazi,’ which does not happen again, right? If you do not believe it, turn to the Appendix, pp. 135f., for reproductions of the documents mentioned above. If the reader has by now opened his mind to that possibility, I can only invite him to read about the arguments of those who do indeed claim that many things about the ‘Holocaust’ were twisted, distorted, exaggerated, and invented. If Heddesheimer’s book is an eye-opener to you, which I think it will be, then I can only invite you to read even more tantalizing revelations, about which you can learn in the back of this book. I think that Don Heddesheimer’s book is a very important contribution to our understanding of the origins of modern time Jewish Holocaust claims. These claims are neither primarily Anglo-Saxon nor Soviet-Communist. The victorious nations of World War Two surely seized upon the opportunity to take advantage of such propaganda and to increase its scope and impact. But the original propaganda claims are Jewish-Zionist in nature and part of a propaganda pattern that started at the very dawn of the 20th century. And they have increased in intensity ever since due to their political success and the lack of resistance. This book ought to remind us also of the simple fact that the truth is always the first victim of every war. It is surprising that so many people reject this, when it comes to the most atrocious war ever fought, during and even more so after which the truth was raped and murdered more often than ever before or after in mankind history: World War Two. Isn’t it therefore likely that we were and are being told many more lies about this particular war than about all those other wars, where we all know that our government lied: World War One, Korea, Vietnam, and the wars against Iraq? “Nothing illustrated the Jews’ new status more clearly than the Senate response to the Romanian pogroms in 1870. The first news reports to reach the United States indicated that ‘thousands’ had been killed in riots in late May. Protest rallies were held in Indianapolis, Louisville, and a half-dozen other cities. After some furious lobbying by Simon Wolf, the matter was brought to the Senate floor by Senator Oliver Morton of Indiana. W. Benz (ed. ), Dimension des Völkermords, Munich: Oldenbourg, 1991, p. 17. German mainstream historian Martin Broszat from the Munich Institut für Zeitgeschichte did so while testifying as an expert witness for the Frankfurt Jury Court, May 3, 1979, Ref. Js 12 828/78 919 Ls. For this, see my study “Discovering Absurdistan,” The Revisionist 1(2) (2003), pp. 203-219. W. Benz, op. cit. (note 1), p. 20. Walter N. Sanning, The Dissolution of the Eastern European Jewry, Newport Beach, CA: Institute for Historical Review, 1983. “Holocaust Victims: A Statistical Analysis. W. Benz and W. N. Sanning – A Comparison ,” in Germar Rudolf (ed. ), Dissecting the Holocaust, 2nd ed., Chicago: Theses & Dissertations Press, 2003, pp. 181-213. Stalins Vernichtungskrieg 1941-1945, Munich: Verlag für Wehrwissenschaften, 1995, pp. 160f. ; English: Stalin’s War of Extermination 1941-1945, Capshaw, AL: Theses & Dissertations Press, 2001, pp. 189f. David Irving, Nuremberg. The Last Battle, London: Focal Point, 1996, pp. 61f. Brighton: Historical Review Press, 1976. All following quotes are from the 3rd edition, Chicago, IL: Theses & Dissertations Press, 2003. Ibid., p. 103. This is the same Rabbi Hertz who already as early as 1922 referred to “1,000,000 human beings […] butchered” during pogroms in the Ukraine, New York Times, January 9, 1922, p. 19; see p. 55 and Appendix, p. 117. See Butz ’ chapter “The First ‘Extermination’ Claims and Washington,” starting on p. 81 of his book, ibid. Retranslated from the introduction of Walter A. Berendsohn to Thomas Mann, Sieben Manifeste zur jüdischen Frage, Darmstadt: Jos. Melzer Verlag, 1966, p. 18. I am grateful to R.H. Countess for bringing this to my attention. Don Heddesheimer has published an earlier, shorter article on this topic: “Holocaust Number One – Fundraising and Propaganda,” The Barnes Review, 3(2) (1997), pp. 19-24. “Pogroms in Poland,” New York Times, May 23, 1919, p. 12. E.g., “Jews of Poland Again Face Period of Want”, New York Times Sunday Magazine, May 28, 1926, p. 8. “Tenenbaum quits Polish Group Here. Charges Anti-Semitic Policy Abroad in Resigning as Head of Good-Will Committee,” New York Times, Nov. 20, 1931, p. 26. “Racial Bias Viewed as Threat top Peace,” New York Times, Feb. 22, 1932, p. 20. “South Russian Jews Raise Strong Army,” New York Times, December 20, 1922. It is possible that this claim is an exaggeration itself, though it is quite likely that Jews joined the armed forces of the early Soviet Union more eagerly than non-Jews. Jonathan Jeremy Goldberg, Jewish Power, Reading, Massachusetts: Addison-Wesley 1996, pp. 98f.